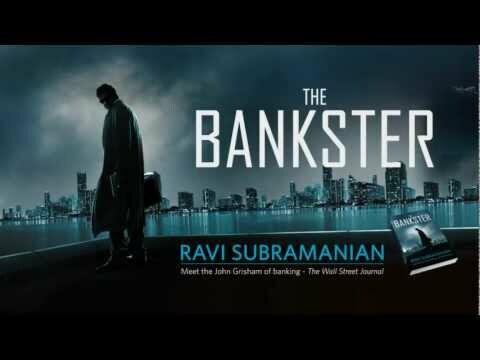 At a time when the entire Banking industry is being criticized for being selfish and money minded, bankers being accused of being untrustworthy, this book by Ravi Subramanian seems to come like a blockbuster movie addressing right what the audience wants. Bankster is derived from Banker + Gangster; a notion I would dislike considering that I am a banker myself. Ravi Subramanian is a banker himself and thus he understand the banking industry. Being called the John Grisham of Banking, I am not sure as I am yet to read the other 4 books of the author, however this book certainly presents an interesting real like plot with fast paced thriller embedded. The primary story revolves around Great Boston Global Bank (GB2), a trusted MNC Bank where suddenly employees start loosing lives and when questions is started being asked by the Compliance Department Head “Raymond” and her friend “Harshita”, they too end of being dead. While the story initially leads with “Vikram” being the lead character who has the image of flamboyant banker, it gradually winds up to revolved around “Karan”, an ex Banker, currently journalist who becomes the protagonist and solves the murder mystery within 48 hours. The book exposes the dark side of miss-selling to customer and inefficiencies of Banking system through Zinaida, the new kid in the retail banking block, apparently recommended by Vikram, who grabs a huge account which later on is identified as the source of all problem. The is fast paced thriller revolving around potential murder suspects and finally giving a jolt climax and revealing the real villain. Despite this the book will surely attract readers who are looking for a fast paced thriller intertwined with corporate drama especially Banking “masala”. The three subplots play out will and do not appear disconnected which makes the book a smooth read. This book review is part of the “Book Review” program by Blogadda. More such reviews can be found here. 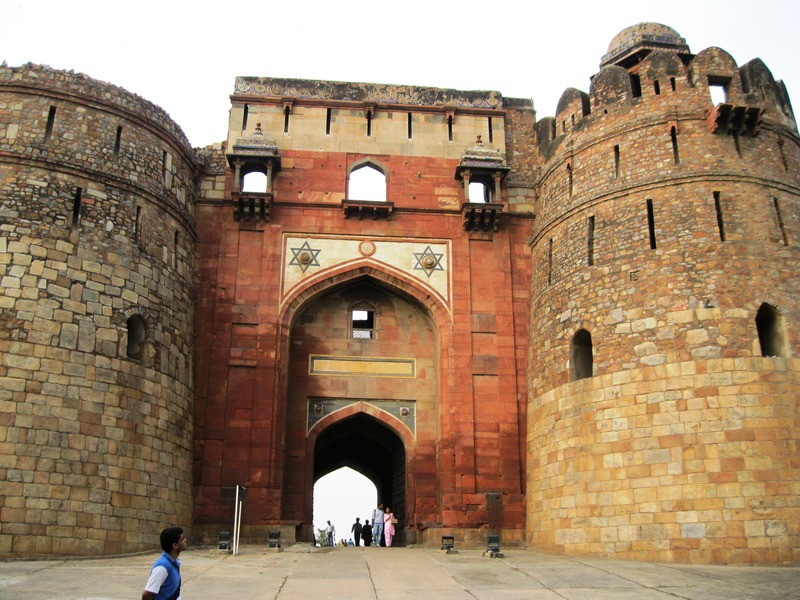 Sign up for the Book Review Program for Indian Bloggers. and get free books! Participate now! I would like to thank Blogadda and its team for providing this opportunity to read and review this book. 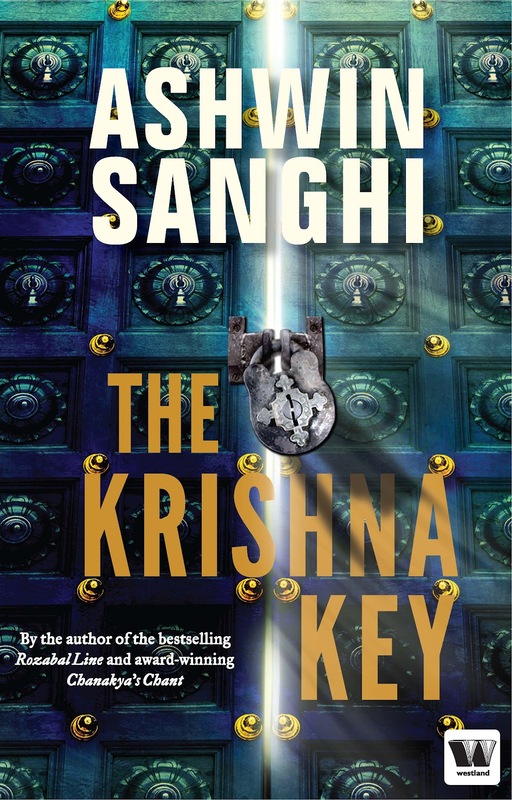 Ashwin Sanghi has come out with his next book “Krishna Key” after “Chanakya Chant”. He has followed the similar 2 story pattern in the book with an interesting plot woven together through intense research which is evident in the novel. Before I go into the review, would like to share this teaser video I found on Youtube for this book. Interesting to have a video marketing campaign for a book. Good thing about the book that you feel is that it keeps you glued, partly by the web of information provided about mythology and Krishna in particular, and partly by the fast turn of events that makes you keep reading and moving on to the next page. Mixing mythology and thriller creates a good concoction like in “Immortals of Meluha”, Ashwin Sanghi has tried his best to do similar thing here. I will give him credit for his effort and research on Krishna (to the extent of quoting his sources down to URL; impressive !!). If nothing else it improves your knowledge of Krishna and makes you want to know more about the beloved “Kishan Kanhaiya”. 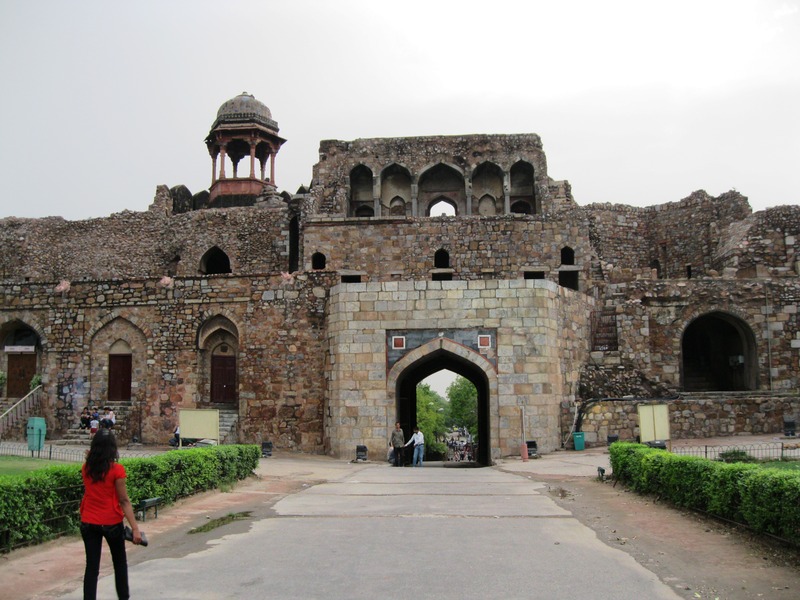 To give a synopsis of the story-line, it revolves around the lead character Ravi Mohan Saini, a history professor with deep interest in mythology and ancient history, getting dragged as a suspect for murder of his close friend who has supposedly made some mind boggling discovery related to Krishna and has created a cryptic message for anyone who wants to solve it. While our professor runs away with his student Priya to prove himself innocent, there are 3 more murders throughout the story line by a character “Tarak Vakil” who thinks of himself as Kalki Avtar (10th avtar of lord Vishnu). With all this bollywoodish romance of running around with a girl and mild moments of intimacy and romance thrown in, the reader is subjected to sudden revelation of Priya being the villain. The story takes a twist from here on with another romantic angle thrown in of Ravi falling in love with Radhika, the cop who was chasing Ravi Saini around (Hilarious !). Amidst all this confusion and chase of finding what Tarak Vakil wanted for murdering 4 people, the story comes to an abrupt climax where the lead character realizes that the prize or the “Krishna Key” is not something material but spiritual. (WTH ! moment). You will also get to read a lot of science logic thrown in here and there to justify the existence of Shiv Lingams. Please read through it with a hearty laugh, nothing serious about it. 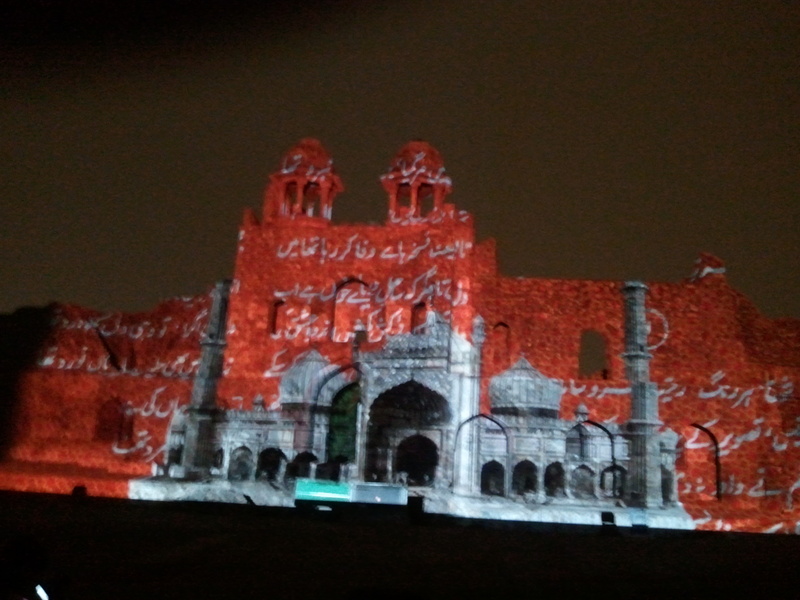 Maybe some sense in writing about religious idols should have been through by the author. All in all, my rating is 2.5 out of 5. An average read and certainly not upto the hype that this book created and the good reputation of Ashwin Sanghi in particular. Read it if you want to enjoy a fast paced thriller and if you are into mythology. If I get more time I would certainly explore the sources that Ashwin Sanghi has mentioned at end of his book. They would certainly form an interesting read for I am sure interested in knowing about Krishna more. 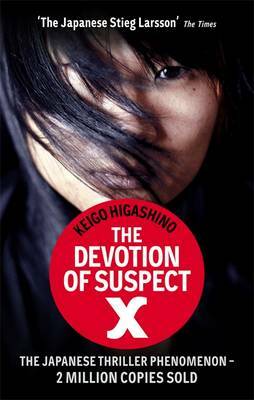 ‘The Devotion of Suspect X’ is one of the most acclaimed works of Keigo Higashino with more than 2 million copies sold. The novel has also been made in a movie Suspect X. The book is a murder thriller and is built around a fast paced plot. Japanese style of writing can be fully enjoyed with interesting to the point plots, fast paced story-line, surprises built in the story making to eager to turn the next page. Some characters have been shown to decipher too much from too little facts but I guess all murder thrillers needs at-least one mastermind to plot the murder and one to break the code. The story starts on a fast-track mode with author clearly establishing Yasuko’s history as a divorcee mother and Ishigami’s secret love for her. Yasuko’s ex-husband shows up to again torture her and extract money. The mother-daughter duo snaps and this is where the murder happens. Fast but messy. Here is where the genius mathematician steps in to help the love of her life. The plot looks very dramatic as Ishigami, though a neighbor of Yasuko, has never really held a conversation with her. Yasuko, it seems out of fear and no way out, accepts Ishigami’s help. While the story on a virtual plane revolves around Yasuko, the center or lead character appears to be Ishigami around which all characters revolve; or to simply put the beauty of author, Ishigami makes them revolve by his perfect game plan. While Ishigami is the one who plots the way the police can never suspect Yasuko, it is Kusanagi and Yukawa who unravel the whole story and keep the reader hooked on to the book. Ishigami plots a masterful, devious and methodical scheme to fool not only the police but also the reader’s in thinking in a tangentially different direction if they try to determine what’s happening next. Without giving spoilers for the book, reader has to extreme attention to details to understand the real motive. The chase of Kusanagi to find the killer seems futile at every moment and pretty much enjoyed by Ishigami who seems to have pre-meditated everything except one factor – his old friend Yukawa who matches his genius. It is he who ends of breaking the code only to learn that the web to protect Yasuko built by Ishigami was much more complex than he could ever imagine. The real suspect – Suspect X was Ishigami, who devoted his life to save Yasuko. 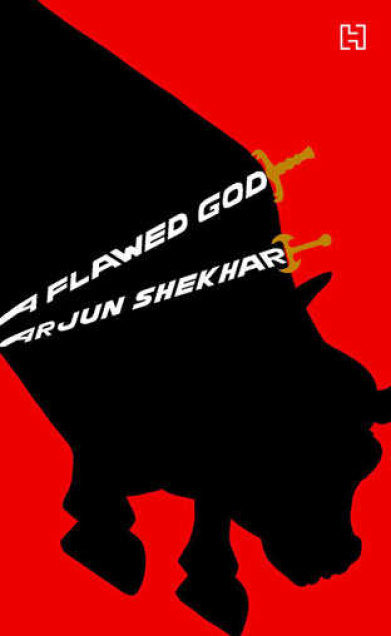 “A Flawed God” is the first book of Arjun Shekhar, an HR professional and now running a consulting firm Vyaktitva from where the experiences inspire him to write this book. The book an be described as a thriller for most of the part where Sachit, the protagonist assumes the role of a Hero rising from his lackadaisical corporate life. The book adds value through the concept of using the employees as owners of the company which is on opposite ends of concept of shareholder ownership. While employee ownership of company has been considered a moral hazard in corporate world, the author is successful in convincing the reader’s of its validity by implementing it through a all employee decision making authority called the Front Line Parliament. Though the concept and its implementation looks like bookish theory, the author is successful in keeping the reader’s hooked on to the book through inbuilt action/drama of HR director being kidnapped and Sanchit’s heroic deed of freeing his boss. While the element of romance could have been done away with, you do find the cute romance developing between Sanchit and Pause, another main character who plays a main role in development of Sanchit’s character. The author adds a unique flavor to each of its characters and you will end up loving each and every one of it. While part 2 of the book is all about drama, action, love and heroism, Part 1 is more of a mystery journey which Sanchit undertakes after receiving a mysterious invitation from the “Progress in Work Collectives” a mysterious organization which runs an invisible initiative to put the organization’s staff at the center of its strategy. Sanchit who has been dragged into the corporate world after ending his cricketing career due to a max fixing scam, finds himself utterly demotivated in his job. This invitation brings to him the much needed excitement and he proceeds to Turkey for Lazuli Playshop for induction in the guild. Just when the journey becomes exciting with all the suspense & hype it leaves the readers hanging in the middle by saying that there is a separate report published as a booklet which contains the description of the Workshop. The second part of the book though exciting is for most parts disconnected from part 1. These two are probably the only faults in the book. The book ends with an exciting thriller climax where things happen super fast. HR Director rising to the occasion and taking the leadership role to make Frontline Parliament a success is as fast as the disclosure that the “Collectives” was all a hoax played by Pause on Sanchit. But the pace is good for the adrenalin rush you get by the moment you reach the climax anticipating what all can happen next. Finally, The book is a good read for its unique subject & for the fact that it talks about corporate culture in an intelligent & entertaining manner. This book review is part of the “Book Review” program by Blogadda. More such reviews can be found here. I would like to thank Blogadda and its team for providing this opportunity to read and review this book. Recently I bought a deal from mydala.com where based on a lucky draw they were giving away McD coupons worth Rs. 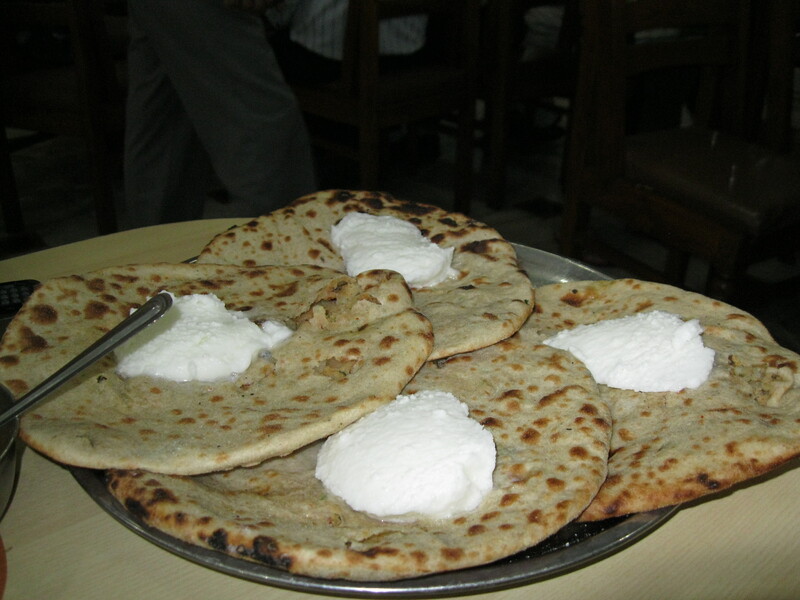 500 for Rs.10. I found the idea most amusing as a website publicized to be a deal website was doing lucky draws and speculative gambling on deals. The catch was that in case you don’t win you would be refunded through mydala point which can be used later. 1. The model of deals on base of lucky draw is like gambling where chances of loosing are more than of winning. So effectively mydala is making you deposit money in form of points which either end up lying there just like that (since you don’t bother about a small sum of Rs. 10 spent on a deal) or ultimately you will make a deal just to get out these points and in the process giving revenue to the website. 2. The voucher itself is highly confusing and prepared to fool the customer. The expiry date mentioned is 1 day before the date of purchase. Further when I called up customer care to clarify this, she said only if the mail says “Congratulations” should I think that I have won the voucher. I dutifully told her that the mail says “Congratulations” to which she said did some verification and came to conclusion that the Congratulations is for getting the mydala voucher safe and sound in my inbox but not the McD voucher. I really don’t feel the need to be getting congratulated for a voucher which is of value zero. I am sure there are couple of other such websites which try to fool around people with such tactics. 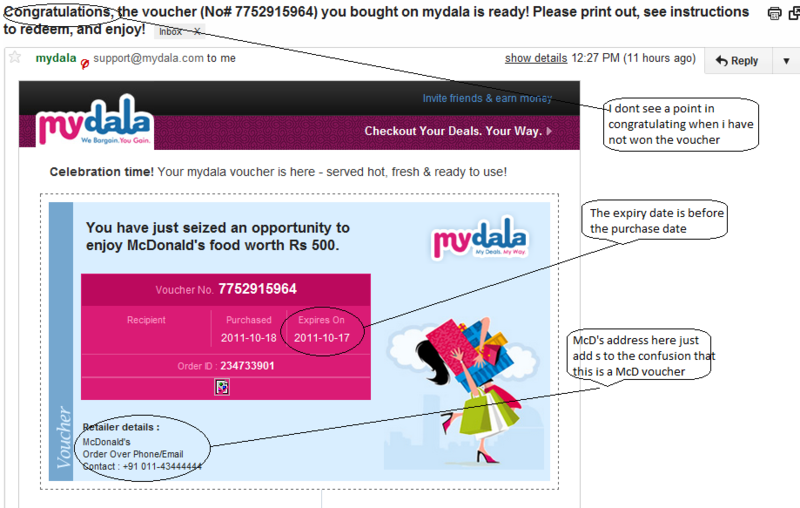 Luckily the customer care of mydala was polite which calmed me and allowed me a chuckle as I let Rs. 10 go into the kitty of the website and registered as my points (which I don’t know when I would use). I am most certainly curious if any of the reader’s have won any deal through such draws on any website. let me know your views too. 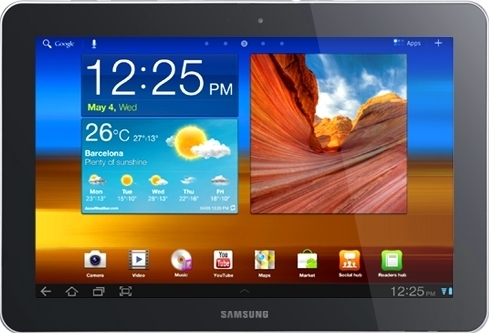 The views expressed in this post are personal to that of the author. So what is the movie all about? The storyline of District 9 is set in the town of Johannesburg, South Africa. 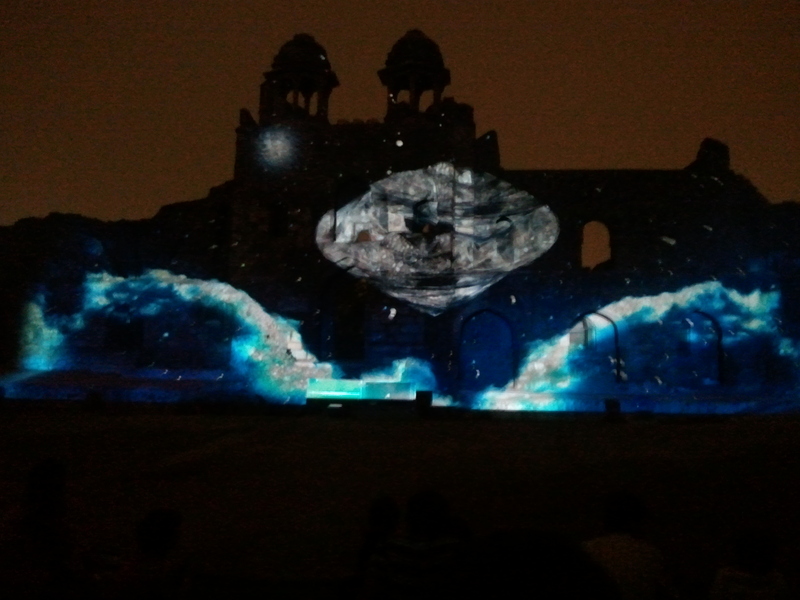 The movie starts with telling that 20 years ago an alien spaceship came out of nowhere and just hung up in air. The humans decided to go inside the ship and there they found malnourished aliens which were rescued. These aliens were put up in an area which came to be known as District 9. Given the way these aliens look people started calling them “prawns”. For 20 years they have been surviving in District 9 and the area has now become a slum where Nigerian gangsters conduct their operations. The actual fun begins now, that is 20 years since the arrival of aliens, when the government decides to relocate the aliens to a new place and Wikus Van De Merwe (Sharlto Copley) a bureaucrat from government agency MNU is given the responsibility to give eviction notice to the aliens. While serving eviction notices, Wikus comes in contact with an alien fluid which apparently starts transforming him into the alien. He becomes the first case of a successful human alien hybrid. Ironically, when the bosses at MNU find his condition they capture him and treat him as a subject for experiments. Somehow he manages to escape and finds shelter in the very same District 9, a place where no humans would go. He comes across an alien named Christopher and the movie then continues on the plot of Wikus and Christopher (the alien) teaming up to recover the fluid which apparently would help the aliens power up their ship and in turn Christopher would help Wikus get back to normal. Excited about the movie? It’s worth watching for the uniqueness that it offers. Unlike traditional alien movies where there is huge animation and drama of a war on earth stuff, this movie actually shows aliens residing for 20 years on earth and it’s the aliens that fear the humans. What is even more worth seeing here is the alien-human emotional relationship that develops between Wikus and Christopher (the alien), a concept which is quite unheard of. The movie ventures into the traditional human trait of being selfish and even goes on to imagine the aliens as having the human trait of sentiments and emotions. The movie is visually appealing with the film using faux-documentary footage, news reports and security cameras combined with traditional photography to create its own kind of realism, giving the viewer the distinct feeling they are on the lam right next to Wikus. Although there is no heavy animation used, the alien characters look quite real. Some things which I was curious and particularly confused when I watched the movie was firstly, the aliens spoke English. How did they know the human language? I can maybe stretch my imagination to say that since they are technologically way advanced than humans, they might have found some way to know our language before they decided to crash (hang up!) on earth. Another thing is why have the humans have not tried to torn apart the entire mother-ship of aliens while it has been hanging up in the space for 20 years. After all we do love to do experiments, rite! All in all a good entertainment and a must watch. It did left me with the thought of how we humans might end up treating aliens if we ever get to interact with a weaker species out there. The article expresses the personal views of the blog author. Comments and feedback is appreciated..